Glow-N-Bowl is bowling with a twist. First we turn off the lights, turn on the black lights, and the place starts to glow. Then we turn on our LED disco lights and multi colored Lane lights! Neon colored Bowling balls are rolled down the lanes at the glowing pins, all while some of your favorite songs are played. If there is a game on, you'll be sure to see it on our two Jumbo TV's above the lanes! Don't be fooled to think this is just for kids. Glow-N-Bowl is great for everyone! If you have never experienced Glow-N-Bowl, you don't know what you're missing. Before you even get here, make sure to wear as much white and fluorescent clothing as you can...why you ask? Well, the most unique feature of our bowling alley will be all of the black lights that set the alley aglow for the night. So, the more you dress to the environment, the brighter you will glow! The bright glowing Bowling pins will serve as the centerpiece to the décor. Our normal food and drink services are almost always running too, so feel free to eat, drink and be merry as you play! 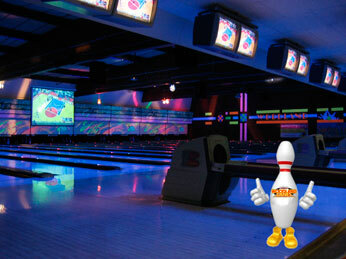 Glow-N-Bowl is regularly held on Friday nights after 10:00pm, when our leagues are finished. Our Glow-N-Bowl times may vary, however, so please call ahead just to be on the safe side!